A pioneer of the all-day property auction both regionally and throughout Ireland, O’Donnellan & Joyce auctioneers will host its next all-day auction from 10am tomorrow in The Harbour Hotel, with close to 50 properties going under the hammer. Anticipation has been growing ahead of the auction which will feature a combination of highly attractive properties, including spacious commercial units, superbly located residential and holiday homes, and a number of excellent land plots, some of which come with planning permission for further development. Considerable excitement for the all-day auction has the O’Donnellan & Joyce phones ringing off the hook and vendors experiencing a huge amount of footfall from enthusiastic hopeful buyers at open viewings. Three hugely successful O’Donnellan & Joyce auctions have already taken place in 2015 generating a staggering total of €12 million in property sales. Remarkably, this brings the total auction sales for the first half of 2015 close to the total auction sales of 2014, which peaked at just over €12 million. The rapidly growing popularity of the O’Donnellan & Joyce all-day auction model promises tomorrow's auction will be a must-attend event for buyers and investors throughout the country. The properties showcased in the all-day auction are well located with attractive reserve prices. Five fabulous Salthill apartments will be up for the taking, presenting an unbeatable opportunity for investment in a popular tourist destination where properties rarely come on the market and offering year-round rental opportunities. A sale of land located across Mayo and Donegal has already had the O’Donnellan & Joyce phones ringing non-stop, as have recently refurbished commercial units in Doughiska, Galway, and in the busy retail area of Ellison Street, Castlebar, Co Mayo. A large number of well-located residential homes will also feature in the auction and are sure to be snapped up on the day, most notably No 4 Presentation Road, a semidetached property in Galway city centre with an exquisitely refurbished interior that oozes style, class, and luxury and has already garnered tremendous media and buyer interest. O’Donnellan & Joyce is positioned as Ireland’s leading property auction house outside Dublin. The O’Donnellan & Joyce agents have expressed their anticipation of tremendous interest in these properties; leading auctioneer Colm O’Donnellan, the first auctioneer to host an all-day property auction in Galway in 2014, said he was overwhelmed with the reaction, particularly from investors outside Galway looking to acquire residential investments close to the university and the city centre. The high profile generated nationally by O’Donnellan & Joyce and the efficiency with which properties are brought to auction by the highly motivated team has led to increased demand among vendors as far as Donegal to Kerry for professional auction room sales of commercial and residential properties; the open and transparent sale process offered with an O’Donnellan & Joyce auction appeals to many who seek a speedy, efficient sale. 1. Land at Drum East, Oranswell: Circa 28.8 acre site, €300,000. 2. No 1 Carraig Palmer, Salthill, Galway: A two bed apartment with sea views, €120,000. 3. No 18 Galway Bay, Salthill, Galway: A two bed apartment with sea views, €125,000. 4. 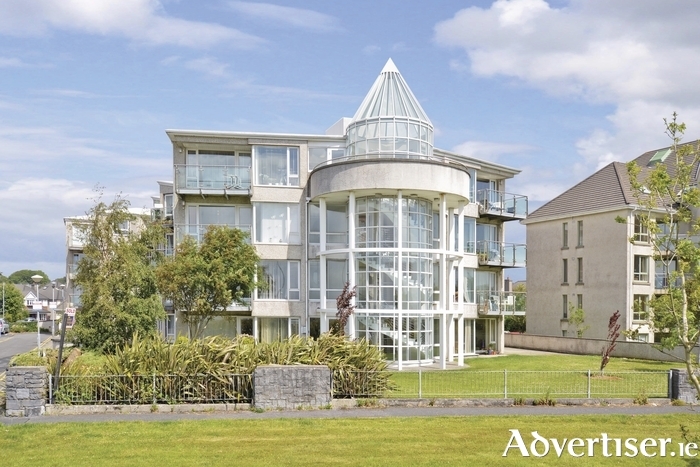 No 1 Arasain Na Mara, Salthill: A three bed apartment with sea views, €145,000. 5. No 14 Arasain Na Mara, Salthill: A one bed apartment with sea views, AMV €110,000. 6. No 19 Lisdonagh, Bishop O’Donnell Road: A two bed apartment, AMV €80,000. 7. No 73 Cois Na hAbhainn, Ballygaddy Road, Tuam: A three bed semidetached home, AMV €75,000. 8. D’Alton Street, Claremorris, Co Mayo: A four bed bungalow, AMV €70,000. 9. No 38 Greenfields, Convoy, Co Donegal: A three bed semi, €35,000. 10. Glengesh, Ardara, Co Donegal: A two bed detached cottage, €35,000. 11. No 29 Amhra House, Woodquay: A three bed city centre apartment, €120,000. 12. No 3 Altan, Western Distributor Road: A three bed apartment, €110,000. 13. The Green House, Canal Stage, Recess, Co Galway: A three bed bungalow, €80,000. 14. No 15 Clan House, Upper Dominick Street: A two bed apartment, €100,000. 15. No 6 Oakfort House, Oaklands: A two bed apartment, €145,000. 16. Gortnamannagh, Kilchreest, Loughrea: A two bed bungalow, €35,000. 17. No 17 Cúl An Áith, Barna: A four bed semidetached house, €270,000. 18. Apt 1 Castleplace, Stranorlar, Co Donegal: A two bed apartment, €25,000. 19. No 12 Sailín, Wellpark, Galway: A two bed apartment, €120,000. 20. Ratesh, Kilconly, Tuam: A three bed bungalow, €20,000. 21. C1,000 acres of forestry land in Mayo and Donegal: Full details on request, €420,000. 22. No 38 Cúl An Áith, Barna, Galway: A four bed mid-terrace, €250,000. 23. Land at Kincullia, Loughrea: Circa 34 acres of prime agricultural land, €172,000. 24. Coolshannon, Mountcharles, Co Donegal: A three bed detached bungalow, €35,000. 25. Land at Kilreekil, Loughrea: Circa 1.85 acres with planning permission, €20,000. 26. No 9 The Elms, College Road: A two bed city centre apartment, €195,000. 27. Charlestown Road, Ballaghaderreen, Co Roscommon: 3 apartments being sold as one lot, €35,000. 28. No 27 Riverside Apts, Castlerea, Co Roscommon: A two bed apartment, €15,000. 29. Old Rectory Road, Ballyshannon, Co Donegal: A two bed detached house, €80,000. 30. Unit 14, Temple Jarlath Court, Tuam, Co Galway: A commercial unit, €50,000. 31. Ballyglunin, Monivea, Co Galway: A four bed detached home, €110,000. 32. Beach Cottage, Ballyconneely: A four bed bungalow, €160,000. 33. No 4 Presentation Road, Galway: A four bed terraced house, €300,000. 34. No 10A Newcastle Road: A five bed detached house, €220,000. 35. No 83 Devon Park, Salthill: A five bed semidetached house, €475,000. 36. No 86 An Cregan, Barna: A four bed semidetached house, €260,000. 37. No 3 Gort na Bró, Western Distributor Road: A three bed semidetached house, €190,000. 38. Ballyglass, Turloughmore: A four bed bungalow, €195,000. 39. No 20 Inchagoill Road, Newcastle: Executor sale, €295,000. 40. No 17 Whitestrand Road, Salthill: A five bed semidetached house, €350,000. 41. No 59 Rivergrove, Oranmore: A three bed apartment, €120,000. 42. No 78 Gleann Dara, Bishop O’Donnell Road: A four bed semidetached house, €150,000. 43. No 19 Mullán Mór, Tuam Road: A three bed townhouse, €130,000. 44. No 293 Tirellan Heights, Headford Road: A four bed semidetached house, €170,000. 45. No 1 Holly Grove, Renmore: A three bed semidetached house, €235,000. 46. No 11 Woodhaven, Merlin Park: A seven bed detached house, €360,000. 47. Lake Road, Loughrea: A three bed detached house, €250,000. Brush up on the properties for the taking on the O’Donnellan & Joyce website at www.odonnjoyce.com or contact the O’Donnellan & Joyce auction team on 091 564212. You can also watch the auction live tomorrow online at www.odonnjoyce.com.